Background, Resume, and Associated Works. Courses included a combination of studio work (painting, sculpture, large-format drawing) and Art History with an emphasis on Modern Art History. Senior Thesis culminated in a solo exhibit of large-scale mixed media paintings. 1995-1996 Studio Art Centers International, Florence, Italy Specialized in restoration, etching, fresco painting, Italian and Modern European Art History. 2010 Tempe Standpipe Projects and Tiny Teeth Worked with Arizona artist Kristine Kollasch in creating two mosaic pieces on standpipes in Tempe. Also helped her create a three-dimensional mural inside a children’s dentist office. 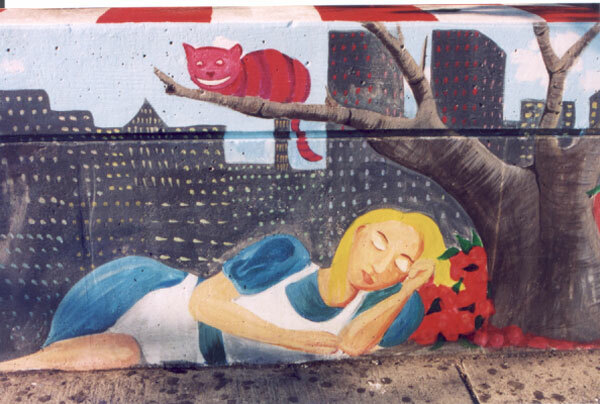 2002	Alice on the Wall, Chambers Street, New York, NY Directed a (c)Cityarts mural in collaboration with students from Stuyvesant High School. An interactive piece, the mural invites its viewers to play with the life-size chess pieces and have a New York style picnic alongside giant ants and cockroaches. Just blocks from Ground Zero, "Alice" combines historical elements with fantasy to create a world where anything is possible. 2001-2002	The Mural Club, Adlai E. Stevenson High School, Bronx, NY Designed an after school program for children ages 14-18. Program included mural awareness and history, community organization, painting, drawing and graffiti techniques, and the design and creation of collaborative murals in Stevenson High School and the surrounding Park Chester community. 2000	Soul Journey, Carroll and Third St., San Francisco, CA Aided in the creation of huge community mural in the Hunter's Point/Bayview area of San Francisco. Worked alongside Precita Eyes Community Muralists Association director, founder and legendary muralist Susan Cervantes. 1998-99	A People's History of Telegraph Avenue, Berkeley, CA Assisted in restoration of prominent thirty-year-old mural granted historical site status in 1998. Worked closely with noted muralists, O'Brien Thiele and Osha Neumann. 2015 Crush it Like Quint, Montauk, NY Painted and installed a mural on polytab of the captain from Jaws crushing a Narragansset beer can, the beer on tap at this sweet outdoor/indoor bar in Montauk. 2015 World of Beer, Stamford, NJ Painted a large, indoor mural with playful images and logos of some of the local beers on tap. 2014 Private Mural, NJ Painted the Rutgers Logo on a garage wall of a home in NJ. 2013 Violet’s Room, NJ Painted a large fantasy mural in a little girl’s room in NJ. Trees, flowers, birds, fox, forest creatures galore! 2013 Bazaarvoice, New York, NY Created a large-scale three dimensional mural incorporating existing architectural elements for an office in Union Square. The city skyline was echoed in the stencils I created for the office desks. 2012 Faux finish, New York, NY Created a venetian plaster wall in a NYC apartment. 2004 Fairyland, Brooklyn, NY A One-hundred fifty square foot mural in a baby's room of fairies, flowers, birds and magical creatures. 2002 Jackie's Sun Room, Conyngham, PA A mural depicting the client's favorite cat sitting on a window-sill overlooking a garden with some of the elements from the surrounding environment. The mural is in the client's sun room and is visible from the street, creating a tromp-l'oeil effect. 2001	Manhattan Treehouse, New York, NY Small outdoor mural illustrating the classes and programs available (including art, music, cooking, dance) at this children's center on West 83rd Street. 2000-01 Memorial to Diana Avila, East Bay Sanctuary, Berkeley, CA A small mural dedicated to the memory of Diana Avila, a Salvadoran woman active in the fight for justice in Central America, who died of cancer in June of 2000. The mural is housed in East Bay Sanctuary Covenant, a Berkeley non-profit organization that serves the Central American community, where Ms. Avila worked for five years. 2000	It's A Jungle Down There, Private Residence, Berkeley, CA Five hundred thirty-two square feet of jungle painted in a little girl's basement playroom, complete with three-dimensional animals and trees made from papier-maché. 2000	Julia's Room, Private Residence, Oakland, CA A mural of more than one hundred butterflies designed for the bedroom of a two-year old girl. 2000	Planet Rainbow, Rainbow Preschool, Oakland, CA A large outdoor mural designed in conjunction with the children of Rainbow Preschool, featuring images of animals, outer space and underwater creatures. 1999	Chiropractor's Office, Kun Chiropractic, Hayward, CA Office installation for local chiropractic office. Fourteen body-inspired panel paintings created and installed throughout the waiting and examination rooms to create a warmer environment. 1999	Sign Language Alphabet, Gan Shalom, Berkeley, CA A border painting depicting the letters of the American Sign Language created in a pre-school in Berkeley. Working with Natalia was great! She gave us a sketch ahead of time that incorporated the vision we presented. She allowed us to make changes to the sketch before she came to the house and even that day while she was painting we were able to add or discuss items in the sketch. Her work is beautiful and did a great job of getting the vision out of my head and onto the wall. Our baby's room is going to be so special because of her work and her talent. Vanessa K.
Our startup just got our first ever office and wanted to make a statement - a large 6 foot painting of our logo on the wall! Natalia picked up our logo and created a shadow to make it really pop. She came in on time, and was honestly just a joy to be around. Lovely and talented. Would absolutely hire again. Syd B.
Natalia did an amazing job painting a mural in our backyard. She was very open to our ideas and hearing what we had in mind. After she sent an initial sketch, we were glad to officially hire her. It was about a week from our initial conversation until she had finished the job - incredible! Her finished product was wonderful and we are thrilled with the result. The only negative was that our puppy loved her and after she had finished and left, he was pretty bummed. All in all, I highly recommend her! Carla N.
Natalia did an excellent job of bringing our vision to reality! She was very patient and open to our ideas. The mural in our children's nursery is just what we wanted! Sandra R.
What a remarkable individual, the process of the job i needed to get done could not have been any easier. I dropped off the piece I needed to get finished and she got it done in less than a week and shipped off to me. Thank you so much for what you did, my friend absolutely loved it! Zuleyka M.
Working with Natalia was amazing. She was really responsive and flexible with our design. We knew what we wanted right away and she was willing to do the research to find the Rutgers logo we wanted. Once Natalia came to our house, she made sure that everything was exactly how we wanted it, from the position on the wall, to the size and colors! I would highly recommend Natalia to anyone who is in need of murals or artwork! Katlyn V.